A few weeks ago I wrote about John Boles, my 3rd great granduncle who just up and disappeared. And then the coolest thing happened! I got an email from a stranger named Helen. She came across my blog post and got curious. She decided to do a little digging and she found my family. I had not even considered South Africa before. She sent me a few documents she had found and I happily reviewed them and updated my tree with her excellent and accurate information. She also mentioned that she lives in Carluke, Scotland and would be happy to help in the future if I needed anything. I instantly thought of this photo of my great grandmother. I told Helen about the photo and asked if she might be able to recognize where Mary is standing. She replied that Carluke is a very small place and it’s quite possible she would be able to recognize it and to please send it to her along with Mary’s birth date. So I did. I included Mary’s birth date and the address at which she was born – Chapel Street. I clicked send and wondered if I might finally know where Mary was standing. She included photos from google maps. 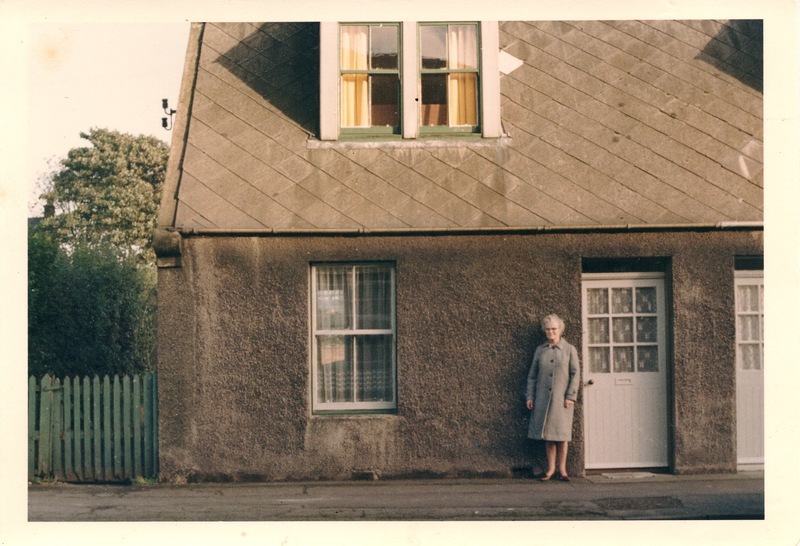 I compared and sure enough, Mary is standing in front of 76 Chapel Street, Carluke. I finally know where Mary is standing! She is standing in front of her home. The home in which she was born. And that home is still standing. One day, I hope to stand in front of this home too. Once again I am overwhelmingly grateful for the 52 Ancestors challenge. My one post led to a kind stranger solving two of my genealogy mysteries. Thank you Amy and thank you to my new friend Helen. I am so grateful. This is what blogging is all about – making those wonderful connections. This one brings tears to my eyes. I love it. Awesome!…and it is so great of Helen to offer her assistance. I love stories that show how generous people are. Thank you! Thank you Lenore, it was pretty exciting. What a wonderful story. Discovering relatives, and then being able to collaborate with them, is my favorite part of blogging. Ah, the power of the genealogy world. Don’t you love it?! How did Helen know to look for your family in South Africa? It really is so amazing how putting it out there brings so much back to you. I love the generous spirit of genealogists. I love how generous genealogy people are. Making connections like this is one of the many reasons why I blog. Congratulations on your finds! This is so wonderful and thrilling! Thank you Luanne, it was really delightful! Glad you finally know where in the world that picture was taken. I was going through a dresser drawer today that has been untouched for quite awhile and found several old photos. I know everyone and am pretty sure where they were taken, but I didn’t know those were in that drawer and it made my day. What a happy discovery! Genealogy is really just a bunch of happy discoveries isn’t it? This is fantastic!!!! This is why I dug into genealogy blogging in the first place. Congrats on your new connection and info!! Thank you Jillian! It was so exciting.